LOS ANGELES – The ultra-high-field 7T Terra magnetic resonance imaging (MRI) scanner at the USC Mark and Mary Stevens Neuroimaging and Informatics Institute (INI) of the Keck School of Medicine of USC has received FDA approval for clinical use, opening up new avenues of care for patients with Alzheimer's disease, multiple sclerosis and other diseases that affect the brain. 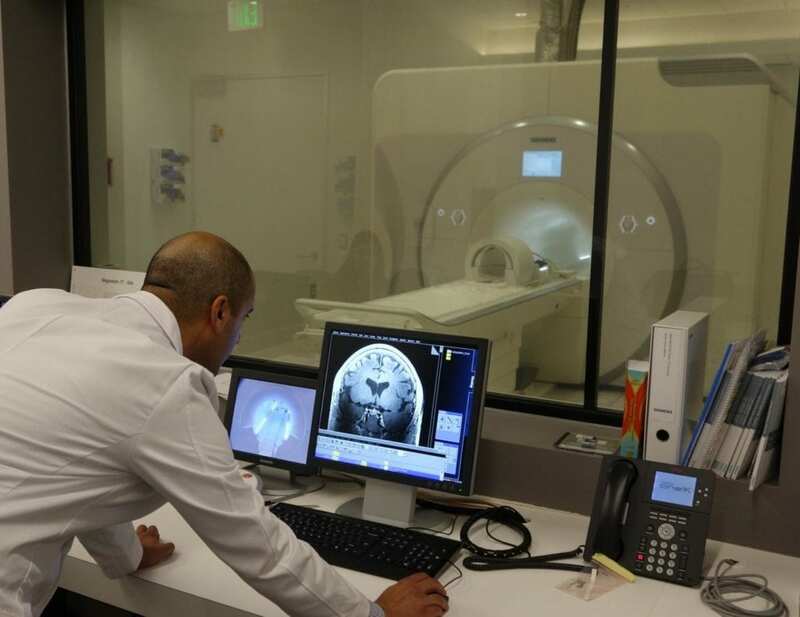 The scanner, the first of its kind in North America, was installed in February 2017 and has already fueled exploratory research into brain activity and structure in both health and disease, unlocking a universe of detail never before seen. With the new hardware and software updates, the machine's advanced imaging technology can now be used to help diagnose, treat and monitor patients with neurological diseases. "This device, which has already made its mark as a powerful tool to advance research in the neurosciences, is now accessible to clinical populations in addition to researchers," said Arthur W. Toga, PhD, provost professor of ophthalmology, neurology, psychiatry and the behavioral sciences, radiology and engineering and the Ghada Irani Chair in Neuroscience at the Keck School and director of the USC Stevens INI. "Clinicians across the university and beyond can now leverage all the benefits of increased spatial resolution to serve patients in need." With a magnetic field strength of 7 Tesla, more than four times that of MRI scanners used in most hospitals, the Keck School's 7T Terra has a strong signal-to-noise ratio, allowing researchers and clinicians to collect images of the living human brain with higher spatial resolution and better contrast than was previously possible. In a typical 1.5 Tesla scanner, each cubic unit of the image — each "voxel" — contains about 100,000 brain cells. At 7 Tesla, a voxel depicts just a few thousand cells, allowing scientists to study the brain with more precision and detail. "It's really a dramatic improvement," said Danny JJ Wang, PhD, director of imaging technology innovation at the INI and professor of neurology and radiology at the Keck School. "Ideally, we want to look at the smallest group of neurons possible so we can start to pinpoint what's happening at the cellular level." The 7T Terra is ideal for high-resolution structural and functional neuroimaging, exploration of neurodegenerative diseases such as Alzheimer's and Parkinson's, and diagnosis and treatment of other diseases that affect the brain, including multiple sclerosis, stroke and vascular dementia. In 2017, Toga and Gabriel Zada, MD, of the Keck School, used the 7T Terra to perform the first ultra-high-resolution scan of a Cushing's disease patient in the United States. They were able to localize an extremely small pituitary tumor not visible on 1.5T or 3T MRI scanners, suggesting that the new technology could replace the standard invasive diagnostic methods for Cushing's disease. Their findings were published in March 2018 in the Journal of Neurosurgery. "The 7T may save patients an invasive procedure. It also makes it easier for neurosurgeons to selectively remove a tumor without damaging surrounding areas," said Zada, an associate professor of neurological surgery (clinical scholar) at the Keck School. Reconfiguring the 7T Terra for clinical use involved minor hardware and software updates to comply with FDA standards. For more information about the scanner, visit cia.ini.usc.edu. Founded in 1885, the Keck School of Medicine of USC is among the nation's leaders in innovative patient care, scientific discovery, education and community service. The school has more than 1,750 full-time faculty members and voluntary faculty of more than 2,400 physicians. These faculty direct the education of approximately 800 medical students and 1,000 students pursuing graduate and postgraduate degrees. The school trains more than 900 resident physicians in more than 50 specialty or subspecialty programs and is the largest educator of physicians practicing in Southern California. Keck School faculty also conduct research and teach at several research centers and institutes, including the Eli and Edythe Broad Center for Regenerative Medicine and Stem Cell Research at USC, USC CardioVascular Thoracic Institute, USC Institute of Urology, USC Mark and Mary Stevens Neuroimaging and Informatics Institute, USC Norris Comprehensive Cancer Center, USC Roski Eye Institute and Zilkha Neurogenetic Institute. Building on three decades of leadership in the neurosciences, the USC Mark and Mary Stevens Neuroimaging and Informatics Institute (INI) was founded in 2013 with a landmark gift of $50 million from USC trustee and benefactor Mark Stevens and his wife. The institute, which comprises four interdisciplinary centers, the Laboratory of Neuro Imaging, Imaging Genetics Center, Center for Image Acquisition and Center for Integrative Connectomics, is populated by 19 faculty, more than 100 staff and student researchers and thousands of collaborators around the world. INI researchers have launched and contributed to many of the most impactful efforts in the neurosciences, including the National Institutes of Health BRAIN Initiative, Alzheimer's Disease Neuroimaging Initiative (ADNI), Global Alzheimer's Association Interactive Network (GAAIN), Human Connectome Project, Mouse Connectome Project, Enhancing Neuro Imaging Genetics through Meta-Analysis (ENIGMA) consortium, Parkinson's Progression Markers Initiative (PPMI), Epilepsy Bioinformatics Study for Antiepileptogenic Therapy (EpiBios4Rx) and many more. In addition to mapping brain structure and activity in health and disease, the institute has emerged as a leader in informatics solutions, providing key data management services including archival, harmonization, quality control, visualization and dissemination for hundreds of studies, thousands of scientists and millions of subjects worldwide. For more information, go to ini.usc.edu.